The price to pay for development is pollution. The most polluted cities today are the ones that are that are densely populated and paradoxically, also the potential centers of opportunities. In India, about 100 million tons of pollutants are being added to the atmosphere annually. This figure is likely to go up in future.Polluted air is harmful not only to humans, but also to the biosphere as a whole. All of us contribute in generating air pollution, either directly or indirectly. It is therefore imperative to understand air pollution in detail and evaluate the means of controlling and preventing it. The air pollution is evident in cities in the form of smog. 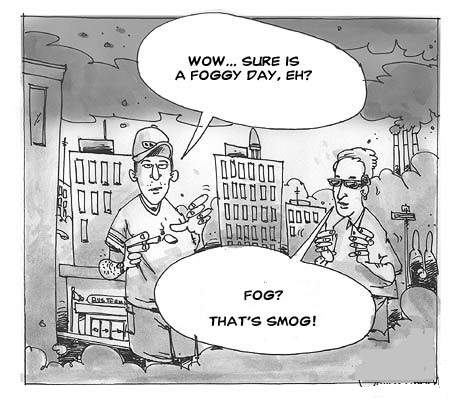 The word smog is derived from the two words – smoke and fog. Smog is a yellowish or blackish fog formed mainly by a mixture of pollutants in the atmosphere, which consist of fine particles and ground level ozone. Smog that occurs mainly because of air pollution can also be defined as a mixture of various gases with dust and water vapor. Smog also refers to hazy air that makes breathing difficult. Historically, smog has caused widespread destruction in the world. The smog of 1952 in London killed approximately 8,000 people. On 7th December, 2015 smog gave completely a different view of Beijing enveloping the entire land with it. For the first time in the history of China’s capital, a 'smog red alert' had been declared for three days. 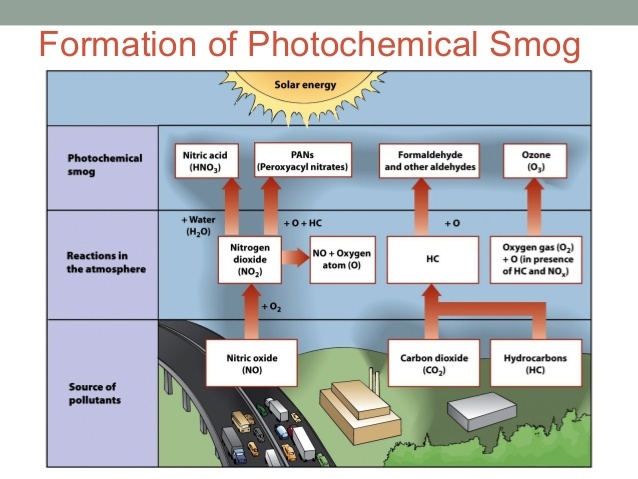 Smog usually is produced through a complex set of photo-chemical reactions involving volatile organic compounds (VOC's) and nitrogen oxides in the presence of sunlight that result in the production of ozone. Smog-forming pollutants come from many sources, such as automobile exhausts, power plants, factories, and many consumer products, including paints, hair spray, charcoal starter fluid, solvents, and even plastic popcorn packaging. In typical urban areas, at least half of the smog precursors come from cars, buses, trucks, and boats. Major smog occurrences often are linked to heavy motor vehicle traffic, high temperatures, sunshine, and calm winds. Weather and geography affect the location and severity of smog. Because temperature regulates the length of time it takes for smog to form, smog can form faster and be more severe on a hot and sunny day. When temperature inversions occur (warm air stays near the ground instead of rising) and winds are calm, smog may stay trapped over your city for days. As traffic and other sources add more pollutants to the air, the smog gets worse. Smog is often more severe away from the pollution sources because the chemical reactions that cause smog occur in the atmosphere while the reacting chemicals are being moved by the wind. As is evident from the components that form it, smog can be extremely harmful to humans, animals, plants and to the nature as a whole. 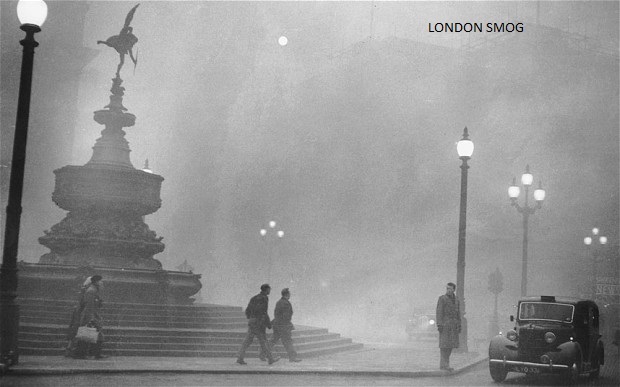 Deaths due to bronchial problems are reported when the smog increases. Heavy smog is responsible for decreasing the UV radiation greatly from earth. Thus heavy smog results in a low production of the crucial natural element vitamin -D leading to cases of Rickets among people. When a city or town gets covered in smog, the effects are felt immediately. Smog can be responsible for any ailment from minor pains to deadly pulmonary diseases such as lung cancer. Smog is also known to cause irritation in the eyes. It may also result in inflammation in the tissues of lungs, giving rise to pain in the chest. Other issues or illnesses such as cold and pneumonia are also related to smog. 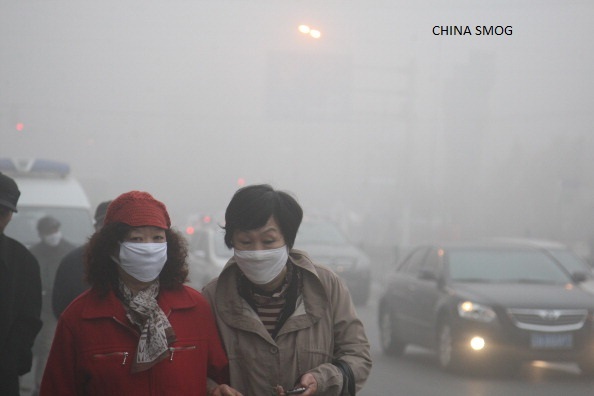 The human body faces great difficulty in defending itself against the harmful effects of smog. Smog is a devastating problem especially due to the fast modernization or industrialization as the hazardous chemicals involved in smog formation are highly reactive is spread around in the atmosphere. Today, the smoke and sulfur dioxide pollution in urban areas are at a much lower level than in the past, thanks to the laws passed to control emissions and in favor of cleaner emission technology. • Decreasing the consumption of fuels that are non-renewable or by replacing them with alternate sources of fuel, which will reduce toxic emissions from vehicles. • Keep your vehicle tires inflated appropriately and reduce the load on the engine and consequently emission. • When buying cars, be particular on using only fuel efficient cars, instead of the gas guzzlers. • When filling petrol, do it during the cooler times of the day to reduce evaporation of fuel into the atmosphere.